What else can you call this guy who has embarrassed himself through PSA/DNA and continues under his own name telling everyone to "follow the leader." Spence has got to be delusional. This self-proclaimed "leader" will help fill your collection with fake autographs or tell you your genuine autographs are fake. He has taken rubber stamped and preprinted signatures and issued his worthless COA stating the item is genuine. What else can you expect from someone impersonating an autograph authenticator? Spence has made a fool of himself at shows authenticating forged signatures as genuine of a celebrity who was attending the same show as an autograph guest. A popular item sold on eBay was the taped interview of Spence on Fox News where Spence authenticated as genuine signatures that were specifically forged for Spence to examine. Another ridiculous situation, James Spence is one of eBay’s authenticators. The above mentioned tape was eventually pulled from being sold by eBay. It was one heck of an embarrassment. With Spence and PSADNA being authenticators for eBay it’s no surprise why so many bad autographs are being sold as genuine on eBay. Not to mention that good autographs are being taken down. These authenticating imposters just don’t know. We can assure you that eBay is very much aware of this autograph authenticating mess. Many are calling these authenticating companies, scams! If anything imaginable could go wrong authenticating autographs at James Spence Authentication, you can be assured it has many times over. Do you want another reason to avoid anything that comes with a James Spence Authentication? Go to eBay, item number 220555250928. B-E Collecibles is offering a Chris Short Single signed baseball. B-E Collectibles states in their description that a Certificate of Authenticity is included from reputable JSA". Now, where did B-E hear that JSA was reputable? We have to believe they know better but this is just one more reason to avoid doing business with any seller who sells something authenticated by one of the companies who claims they can authenticate autographs. This ball got 8 bids from 5 uneducated bidders. It sold for $145.50. "Follow the Leader, James Spence" to the bottom of the autograph barrel. Spence at a minimum needs to be tarred and feathered before fleeing this hobby. Whatever happened when an inexperienced authenticator got it wrong by saying a forged autograph was genuine and issued their worthless COA. Just as often, these simpletons failed genuine autographs. It appears those were the good ole days. Let’s "Follow the Leader" to a new lower level. 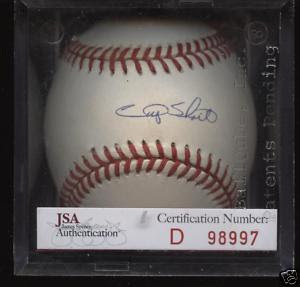 The signature on the ball illustrated above is NOT of Chris Short. It is the fairly common signature of Gary Sheffield. James Spence you hit rock bottom and need to find another vocation. The hobby needs to rid themselves of these quasi-authenticators. In future B-E Collectibles sales., will they still use James Spence Authentication and state "included from reputable JSA"? Most card shops and shows that have James Spence Authenticating are well aware of his authenticating incompetence. It’s all about making a buck and these business need to be avoided. They are all contributing to having a continuous flow of mis-authenticated items enter collections. The hobby is still attempting to self police itself. Collectors need to avoid all shops, shows and the few auction houses left that use these wannabe autograph authenticators!! Bummer for me right? Hahaha!! JSA IS A BIG JOKE! !